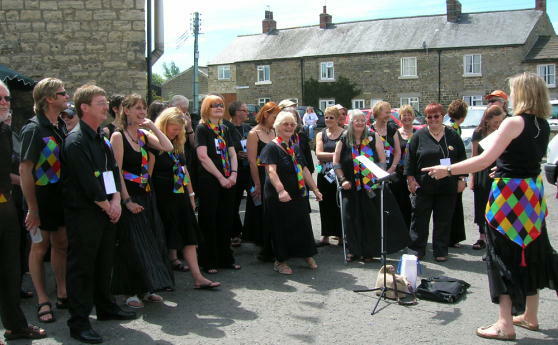 Silsden Singers perform several times a year, at local and regional events, but there is no pressure on any member to sing in public. Silsden Singers normally perform in plain black tops and trousers or skirts, with a personalised trim of our special HARLEQUIN material provided by the choir. For their personalised trims in the Silsden Choir colours, members to date, have ingeniously made scarves, small bags, ties, belts, brooches, and appliqué patches for jacket, waistcoat, and pocket fronts. Here is a Youtube video from the Sing for Water event at the Manchester Day Parade on 19 June 2011. Over 300 people sang to raise money and awareness for Wateraid.